Okay, y'all - Halloween is over. The Holiday Bustle will soon start. Why not take a breather and read a book? 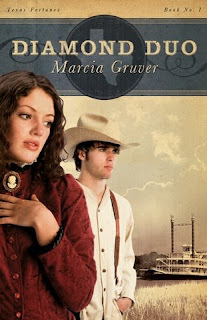 I had the privilege (as well as with several others) to review a book by Marcia Gruver whom I heard about at Writer Interrupted. Diamond Duo is the first book of the Texas Fortunes Series. Bertha loves Thad and would do anything to win his affections. So, when Annie pops into town, turning heads wherever she goes, Bertha is determined to learn her secrets in order to win Thad. But at what cost? I truly enjoy books that introduce characters that are memorable. Diamond Duo is full of them. Not only are the characters memorable (you certainly won't forget them and you might even identify with a few yourself), I love books and stories where I can 'see' the movie playing in my mind. There are always a few that I wish really were movies. This is one of them. Marcia has several goodies that I encourage you to visit. Because it is the start of NaNoWriMo, I thought I'd direct you to her writing interview (my personal favorite -I love knowing where writers started so, like Bertha, I can gain a nugget of information from them). But if you're not the writing geek, you can also check out her Diamond Duo interview. I think you might find it interesting that Marcia played the 'what if' game with a woman who is a bonafide part of the history in Jefferson, Texas. I have several blogs that make my blog roll and some that make my favorites. I particularly like authors' personal blogs because I feel like it gives me the chance to know them. Maricia's in no exception. Yo, Ivy! You sound like my kind of people. Thanks so much for hosting me with such flair. Blessings!